Many job seekers want to keep their private lives private. But what if you could improve your chances of being the selected candidate by using social media? Companies are checking you out online, so why not use these tools to enhance your qualifications? 46% of the hiring managers and human resource professionals surveyed said that reviewing the candidates’ social media content provided a good sense of whether the candidate would be a fit within the company. How often have you thought: ‘If only I could get in front of someone and prove I am a good fit”? With social media, you can inject your style in status updates and even your LinkedIn summary. Sure, your skills and experience qualify you for jobs, but your personality is one more way to seal the deal. When employers see how your background information supports your qualifications for the job, you look like the real deal. 45% of employers liked the idea of being able to validate a candidate’s experience by checking them out on social media. Make sure your LinkedIn and other social network profiles are consistent and close matches with your résumé. What you say in your bio and on social profiles provides hiring managers with a glimpse of your professionalism. 43% of employers were impressed with the professional image presented by a candidate’s site. Use a high-quality photo (preferably a head shot) with a neutral background that’s free of distractions, such as pets or people. Wear work appropriate-clothes – no prom pictures or beach shots. And be sure to pay attention to small details, such as grammar, punctuation capitalization and spacing. 40% of employers selected candidates who came across as well-rounded through information on their profiles and social media updates. Don’t be afraid to show your volunteer involvement and other activities that show how you enjoy spending your free time. One word of warning: If these activities appear too frequently or divulge personal preferences, it can have a negative impact. Avoid mentioning controversial or extreme interests. You say you have excellent communication skills, but how can you further provide proof? 40% of employers said social network profiles and status updates offered evidence of great communication skills. As with your profile, punctuation, spelling and grammar are important in tweets, too. And remember to behave appropriately online. Avoid arguments, profanity and negative rants. Often, employers seek candidates who can think outside the box. 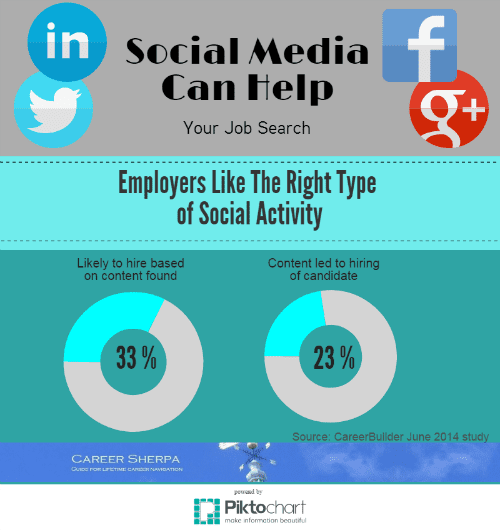 36% of employers said a candidate’s creativity on social media made a difference in the hiring decision. Show off your creative abilities online by displaying an infographic résumé, using new technology or posting clever status updates. In your cover letter or resume, you may have said you were a top performer or gained recognition for your stellar accomplishments. 31% of employers found proof of such recognition online and said it worked in the candidates’ favor. Snap a photo or grab a screen shot to capture your success. Then share it for all to see, and embed it in your LinkedIn profile. 30% of companies liked seeing references posted about a candidate. Unsolicited or nonreciprocal recommendations are powerful. LinkedIn allows you to display recommendations within your profile, so be sure to ask a boss or happy customer to write one for you. You can make it even easier for them when you provide suggestions or key points you believe are worth mentioning. 14% of employers see a large following or subscriber base as a positive. If people are following you, then you might just have something interesting or valuable to say. Thought leadership and community engagement can benefit the company. Build your following organically by providing information that is valuable to your target audience. Interact with like-minded professionals online. Gaining a following isn’t easy. But, if you are a good social community citizen, it could be an asset to your future employer.